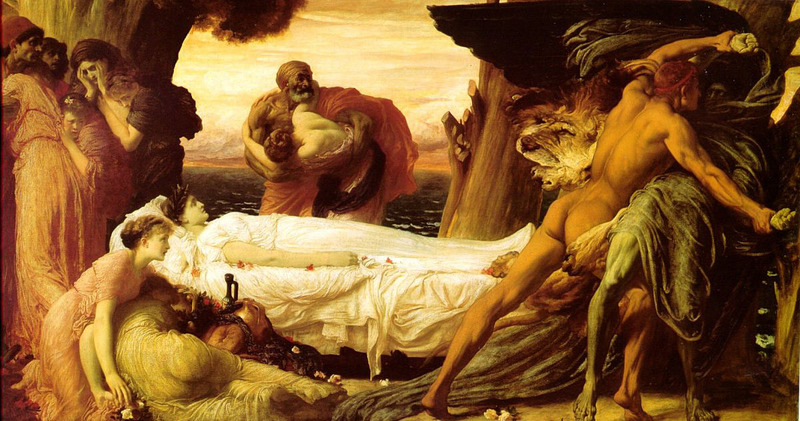 Hercules Fighting Death to Save Alcestis, by Frederic Lord Leighton. Read more about Heracles (including his stop to save Alcestis). Lord Frederick Leighton also painted mythological figures like Actaea, the Hesperides, Andromeda, Aphrodite, a Bacchante, Clytie, Daedalus and Icarus, Demeter and Persephone, Helen, Iphigenia, Lachrymae, Leda, Nausicaa, a river nymph, Perseus, Psyche, a Siren, and a Sybil. .